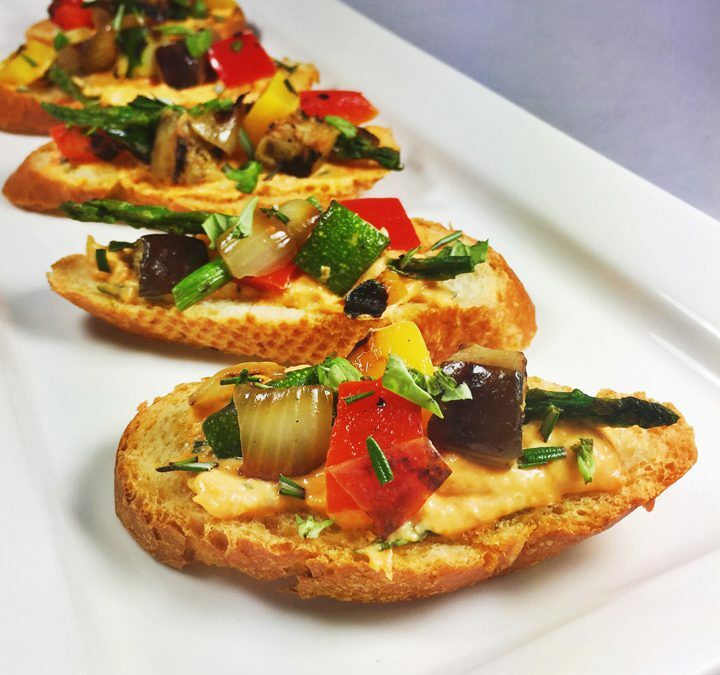 An easy appetizer for your next grilling party or summer event, these crostini come together quickly. Use your favorite grilled summer vegetables to go on top of a crunchy toasted baguette with a smooth and cheesy tomato pesto base. To finish, top with a sprinkle of fresh herbs. A tasty way to use leftover vegetables too! Add the cherry tomatoes, shredded cheese blend, ricotta cheese, pine nuts, garlic clove and a big pinch of salt to a blender. Process until smooth. Add the basil and 1-1/2 teaspoons of fresh rosemary; process until the basil and rosemary are small flecks. Combine the remaining herbs, 1 tablespoon of chiffonade basil and 1-1/2 teaspoons of finely chopped fresh rosemary, in a small bowl. Thinly spread the tomato pesto on the crostini. Top with the grilled vegetables and a pinch of the fresh herbs. Make 16-20 crostini. Grilled Vegetables: Prepare a gas or charcoal grill. Meanwhile, in a large bowl, toss 2 cups your selection of thinly sliced vegetables (such as tomatoes, asparagus, zucchini, eggplant, red pepper, yellow pepper, and onion) with 3 tablespoons of the olive oil, 1/4 teaspoon garlic powder, and a couple generous pinches of salt and pepper. Put the vegetables on the grill in a single layer. Grill, turning once, until grill-marked and tender, about 8 minutes. 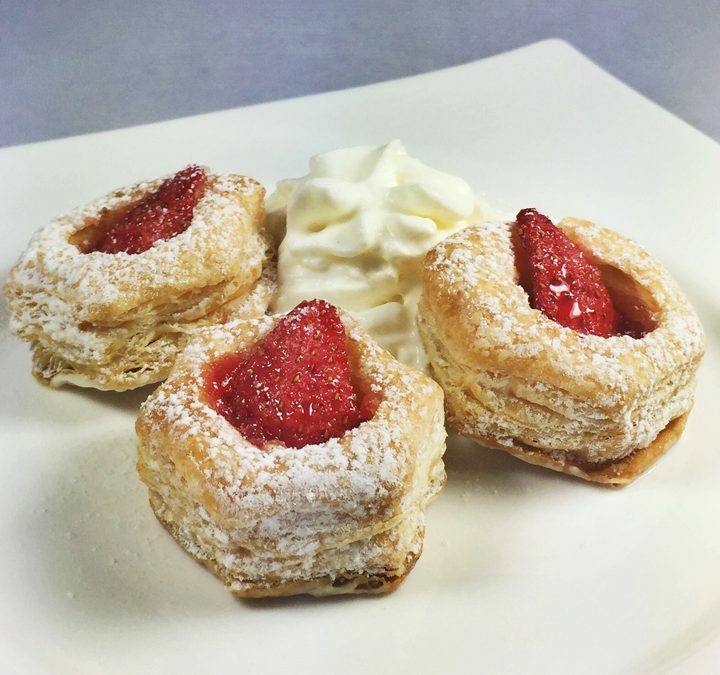 June’s delicious fruits of strawberry and rhubarb are combined together to make these tasty little treats. Fresh berries and rhubarb sauce are added to puff pastry shells that are baked to a delicious crunch. Simply add some whipped cream, for the perfect summer two-bite treat. Add the rhubarb, sugar, and 2 tablespoons water to a large saucepan. Cook over medium heat until the rhubarb has softened and broken down to a thick sauce, about 30 minutes. Remove from the heat and cool completely. Prepare the Puff Pastry shells by following the package directions. While still warm, carefully remove the center pieces out of the baked shells. Cool the shells completely. Preheat the oven to 350 degrees. Place the Puff Pastry cups on a baking sheet. Toss the strawberries in the sugar. Add ½ teaspoon of Rhubarb sauce to each Puff Pastry Cup. Top with a strawberry quarter. Bake in the oven for 10 minutes then remove and cool completely. Dust with powdered sugar, and serve with whipped cream. Makes 8 servings, three tarts per serving. 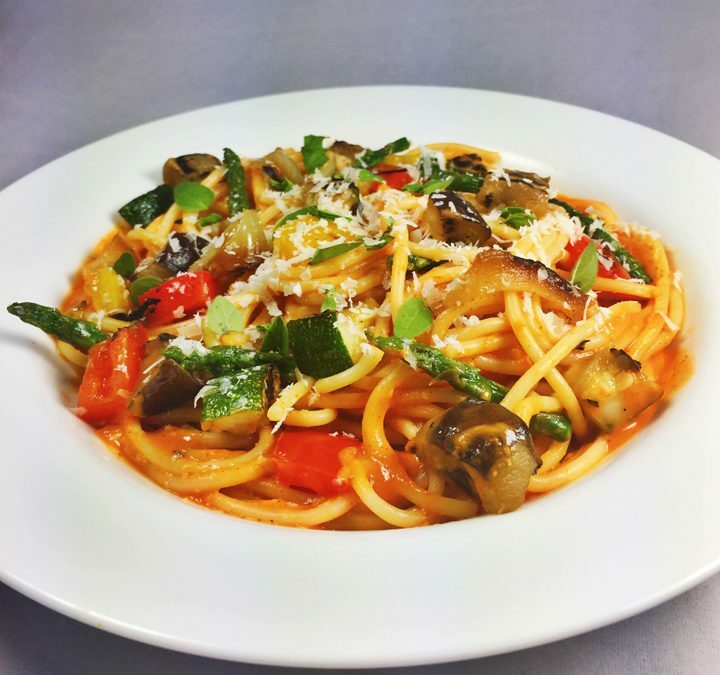 Use the season’s freshest vegetables to make this delicious spaghetti dish. We start by grilling the veggies to add some extra flavor and color. Next, we create a delicious tomato sauce and top everything with fresh herbs and Parmesan cheese. You can use any thickness of spaghetti but we prefer the extra thick to hold up to the vegetables. Prepare a gas or charcoal grill. Meanwhile, in a large bowl, toss the tomatoes, asparagus, zucchini, eggplant, red pepper, yellow pepper and onion with 3 tablespoons of the olive oil, garlic powder, and a couple generous pinches of salt and pepper. Put the vegetables on the grill in a single layer. Grill the tomatoes; skin side down, without turning until their skins have darkened and their flesh is soft. Grill the remaining vegetables, turning once, until grill-marked and tender, about 8 minutes. When cooked, add the tomatoes to a blender container. Transfer the remaining vegetables to another medium bowl and let cool briefly. Grill the lemons, cut side down only, for 5 minutes. Squeeze the lemon juice into the blender; discard the peels. Grill the garlic cloves, with skins remaining for 5 minutes. Peel and add to the blender. When cool enough to handle, dice the zucchini, eggplant, bell peppers, and onion. Cut the asparagus into 1” pieces. Cover and keep warm. Add 1 tablespoon of olive oil to the blender with the tomatoes and garlic; process until smooth. Meanwhile, bring 3 quarts of well-salted water to a boil in a large pot. Cook the spaghetti in the water according to the package directions for al dente. Reserve 1/2 cup of the water, drain the pasta, and return it to the pot. Using the sauce from the blender, toss with the pasta. If the sauce needs to be thinned, use a small amount of the reserved pasta water. Place the pasta in warmed bowls and top with the vegetables, the fresh basil and oregano, a sprinkle of cheese, and serve. Makes 4 servings. Quick to prepare, these cookies are a combination of almond flour, butter, confectioner’s sugar, vanilla, and blood orange zest. 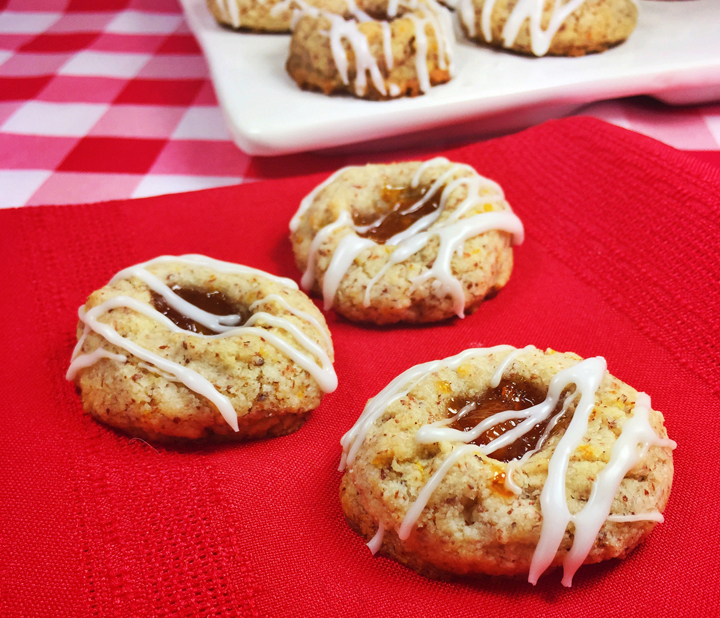 Sweetened with a bit of blood orange marmalade filling, you’d never know our crunchy picnic cookies are gluten free. If you can’t find blood oranges, just substitute tangerine or orange for the zest and marmalade. Make your dessert the complete Italian indulgence – serve with a Hard Italian Soda by Bravazzi! Preheat the oven to 350. Line a baking sheet with parchment paper. Mix all of the ingredients in a small bowl until dough forms. Scoop 1 ½ ” balls of dough onto a parchment lined the pan. Using your thumb or a spoon, press an indentation into the center of each ball of dough. Scoop and press all the dough then place in the refrigerator to chill for one hour. Line two baking sheets with parchment paper. Arrange the balls of dough about 1 ½ ” to 2″ apart. Fill each impression with about ¼ teaspoon of marmalade. Be careful, don’t overfill or your filling could boil out during baking. Bake the cookies for 10-12 minutes, until they start to turn light golden brown on top. Remove the cookies from the oven and cool them on the pan for 10 minutes. Transfer them to a rack to cool completely before icing. Makes about 20-24 cookies. In a small bowl, stir together confectioner’s sugar and milk until smooth. Add in corn syrup and almond extract, beating until icing is smooth and glossy. If frosting is too thick, add a little more milk. Drizzle over the cooled cookies. We adapted this recipe from the fabulous bakers at King Arthur Flour.